Tobacco use is the most common preventable cause of death. About half of the people who don't quit smoking will die of smoking-related problems. 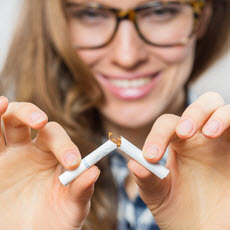 Quitting smoking is important for your health. Quitting is not easy. You may have short-term effects such as weight gain, irritability, and anxiety. Some people try several times before they succeed. There are many ways to quit smoking. Some people stop "cold turkey." Others benefit from step-by-step manuals, counseling, or medicines or products that help reduce nicotine addiction. Some people think that switching to e-cigarettes can help you quit smoking, but that has not been proven. Your health care provider can help you find the best way for you to quit. Article: Tobacco Cessation in Oncology Care.